1.1 Why should you prefer Advantage II for cats? 1.2 How Advantage II works to kill fleas on your cat? 1.3 Is Advantage II safe to use on your cat? If your feline has been developing small bumps on its neck and back, excessively grooming or scratching itself and maybe also experiencing other symptoms like hair loss, it could be a victim of a flea infestation. You can check your cat’s skin for red bumps, scratches and also check the base of its tail to see if it is red or bumpy, another telltale sign of a flea infestation. Advantage II for cats, from Bayer, is one of the most popular and best flea treatment solution for cats today, and with good reason. If fleas are indeed the problem, you must take action to relieve your poor cat. Try to remember the last time you had an unbearable itch. Imagine how it would have felt if you hadn’t done anything about it then. That is how your cat is probably feeling now. 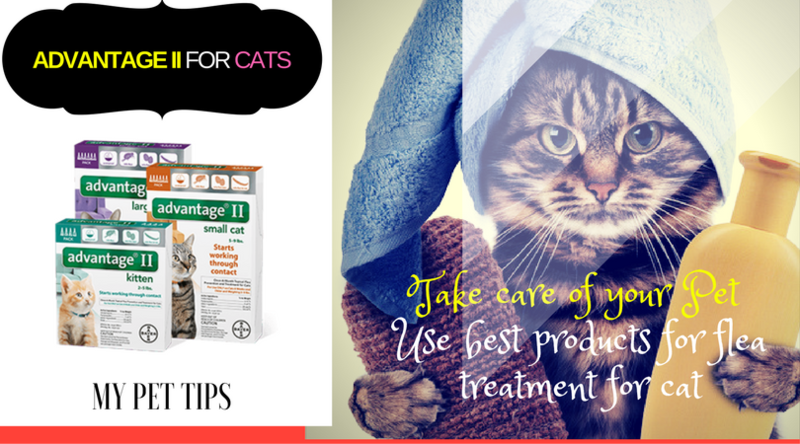 Unlike most other topical treatments, the Advantage for cats application does not require the fleas hiding in your cat’s fur to actually bite your cat. Instead, it works on contact, eliminating fleas quickly and safely, in a matter of just 12 hours or less. Besides being one of the only effective flea treatment that kills on contact, Advantage II is one of the best sellers out there as it takes care of another pesky problem, that of re-infesting fleas, for up to a month. Advantage for cats is also the only 100% effective flea treatment that is also waterproof, even resistant to shampooing, as long as you don’t use detergent shampoo. Why should you prefer Advantage II for cats? How Advantage II works to kill fleas on your cat? 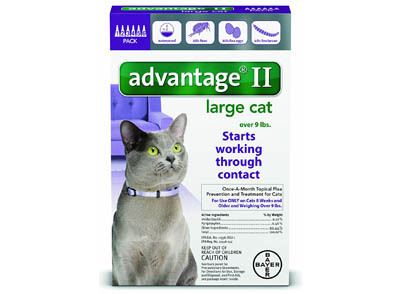 Advantage II uses two primary ingredients that will eliminate a flea problem on your cat. The two ingredients are Imidacloprid and Pyriproxyfen. Here’s a quick note on how these two ingredients will go to work on flea elimination, when applied as a topical solution on your cat. Imidacloprid will first attack the nervous system of the fleas infesting your cat, paralyzing them. Once paralyzed, fleas will die within 12 hours. This process alone will kill 99% of the fleas on your cat. After this process, there is a small chance that yet-to-hatch flea eggs and flea larvae might still manage to hatch and re-infest your cat. That is where Pyriproxyfen plays a role. What it does is act as growth regulator that basically shuts down the flea egg hatching process. The above two pronged approach will end your cat’s flea problems once and for all. Even though 100% flea elimination is assured, it is recommended that you use Advantage II for a few months, as flea pupae that exist in your cat’s environment may still try to infest your cat. Continuing Advantage II after eliminating topical flea problems on your cat will negate or very considerably reduce chances of infestation caused by environmental exposure. Is Advantage II safe to use on your cat? Advantage II for cats is manufactured by Bayer that follows extremely stringent protocols when it comes to product safety. The topical treatment is perfectly safe for you cat. It is however important that you use precaution while applying the product so as to avoid letting the treatment solution come in contact with your cat’s eyes. 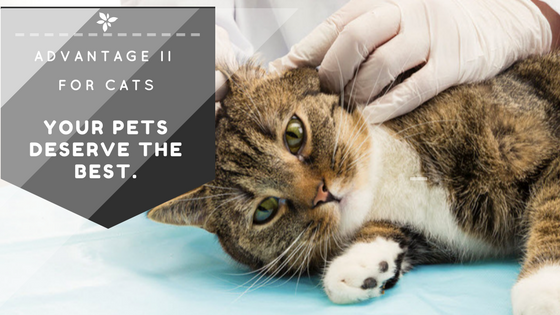 The recommended procedure to apply the Advantage II topical solution is to apply it on your cat when it is calm. Slowly empty the contents of the tube onto the base of your cat’s skull, after partings its hair, so the solution directly goes to the skin. This strategic one-spot application will ensure that your cat does not lick the topical solution. It will also eliminate the probability of the product dripping, entering or even going anywhere close to your cat’s eyes. Advantage 2 for cats is fragrance free. This might give you extra assurance to use the product if your cat gets fussy/restless when it gets sniffy! You may purchase Advantage II for cats here, choosing a kit most appropriate for your cat’s weight.